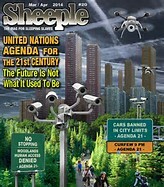 GEORGIA GUIDESTONES: New World Order, Depopulation, and THE NEW TEN COMMANDMENTS! 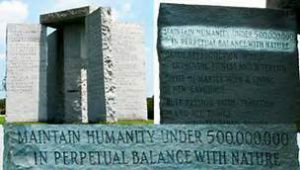 There are two schools of thought regarding the Georgia Guidestones, also known as the American Stonehenge. 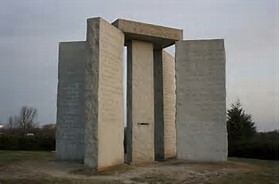 Some believe that the guide stones represent a new course of action to keep humanity on track after we destroy each other in a nuclear apocalypse. 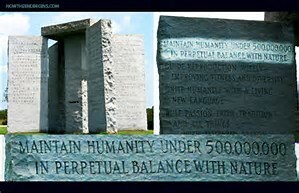 Others believe that the new Stonehenge is an evil monument instilling the values set forth by none other than the New World Order. “The Georgia Guidestones is a granite monument in Elbert County, Georgia,USA. A message clearly conveying a set of ten guidelines is inscribed on the structure in eight modern languages, and a shorter message is inscribed at the top of the structure in four ancient languages’ scripts: Babylonian, Classical Greek,Sanskrit and Egyptian hieroglyphs.
. . . From Wikipedia. Dr Erik Pianka, the American biologist who advocated the mass genocide of 90% of the human race and was applauded by his peers.